"Hi, we're right here," says HRH Prince Khaled bin Alwaleed bin Talal while waving his iPhone 6 Plus at me from the far end of the Meydan Hotel lobby in Dubai. Two things you need to know right off the bat: the first is that he responded to Entrepreneur's interview request personally with a few members of KBW Investment staff on CC, and the second is that he came downstairs with KBW Investments CEO Ahmed Alkhoshaibi to collect us, calling me from his own mobile phone. Decked out in formal National dress, a quick look at his feet betrays a cool factor- he's wearing Converse. "It's 2014," he says, smiling when I point out his choice of footwear. In a professional capacity, HRH doesn't like his formal salutation used, and offers up that it's alright to call him "Abu Jenna or whatever you're comfortable with." Comfortable? Hardly. As royal anomalies go, he's for sure in the 99th percentile and at first I don't know what to make of the man affectionately dubbed the "Tech Prince". A document that I downloaded from WikiLeaks -the URL indicates that this "intel" is part of the mass-released Global Intelligence Files- describes 36 year-old Prince Khaled as "business-minded like his father and serious, but also simple and nice," adding that "he has kept a considerably low-profile in the media, preferring to stay in the background." Immediately after meeting him, I could verify these statements to be true, especially that the apple doesn't fall far from the tree. When Abu Jenna does laugh or smile, his expressions are tempered by what I understand (perhaps incorrectly) to be shyness and a measure of reserve. I need to explain something to you, the reader. When I sit down to interview anyone, be it a high profile celeb or a fresh startup founder, I have to put on a "game face". I have to be bold and probing, and I admit that I create a psychological atmosphere of what can be called "safe sharing". I preface questions with little anecdotes that put the subject in a frank frame of mind, I share personal information that I usually never disclose to encourage my interview subjects to do the same, and finally, I cross lines that I would never even toe outside of an interview space. If my subject happens to be a royal like Abu Jenna, I have to force myself to forget that he is who he is. I have to be a little brazen (okay, a lot brazen), and I really have to force my hand. Why? Because no one wants to read the same old regurgitated PR-friendly quotes. Reader, know that Abu Jenna fields all of my personal intrusions like a champ- he has a great sense of humor, and he's a good sport. If I was on the receiving end of that barrage of leading questions, I have no qualms telling you that I would've been indignant, and maybe even a bit offended. Director General of Abu Jenna's private office, Mustafa Al Ansari, and the aforementioned Alkhosaibi both have expressions of sheer incredulity (and sometimes amusement) during the course of my two-and-half-hour conversation with the Prince. At some point, Al Ansari laughingly tells me that I'm "really pushing it." The result? An honest and surprising discourse with one of the most private royals in the MENA region. Before I ask you to move past his Princehood, I have one (hilarious) royal-related factoid to share. Abu Jenna is a partner in TechnoBuffalo.com, a technology enthusiast website. In 2009, Abu Jenna emailed TechnoBuffalo.com founder Jon Rettinger explaining that he wanted to invest in the Internet startup as a passion project because he "really liked what they were doing." According to a vlog post by Rettinger, he then "Googled Khaled Alwaleed" and found him to be "a Prince in Saudi Arabia!" Once Rettinger confirmed that this was indeed the Khaled Alwaleed, things moved quickly. Abu Jenna laughs as I comment that this story is very similar to the emails I get from a "Nigerian Prince" who wants to transfer me €40 million as part of some far-fetched inheritance payout. I can only imagine what Rettinger's face must've been like, and I would've paid cold, hard cash to be a fly on the wall of his California home that day. TechnoBuffalo.com is laden with in-depth product reviews (some executed in compare and contrast style), and reports both mainstream and obscure tech news. It's pretty comprehensive, Abu Jenna often tweets their vids from his account (@KhaledAlwaleed), and he says that they'll be Arabizing their content in the near future. Admittedly, it's hard to forget that Abu Jenna is the "only son of His Royal Highness Prince AlWaleed bin Talal Al Saud" (something the media loves to drop in any and every mention of him), and instead see him as a man directly managing several enterprises, and sitting on the board of others as the majority shareholder. Before we get into the nitty-gritty of his many different business interests, I tell him that attaching the name of HRH Alwaleed bin Talal Al Saud certainly ups the glam factor of practically anything, and that these frequent mentions of Abu Jenna are often prefaced with HRH Alwaleed bin Talal's name. Abu Jenna emphatically asserts that essentially all he is today stems from that association: "My success is because of this tie to my father. Inherently, and I am very proud of this, the only success that I will ever have is because of being the son of my father. Honestly, if you step back for a second, the person I am today is because of my father; my success came from my father; my success came from the education my father gave me- it came from the practice I've had watching my father do business. I see my father twice a week, three times a week, as much as I can. I have an incredible amount of respect for my father and the success he's achieved in business. I have an appreciation for all that he's taught me, but it's not just business. My father is a wonderful grandfather to my children, and that's something most people don't see. Our relationship is obviously much deeper than business." I read Abu Jenna a quote from a Vanity Fair article stating that HRH Alwaleed bin Talal's tech investment methodology "favors high-growth, high-risk technology companies, which he identifies with the help of a small Riyadh-based investment committee." The Prince says that while the latter is true, the "high-risk" factor isn't, and points out that HRH Alwaleed bin Talal's investments are usually astronomical sums in huge companies, not the startup sort the statement suggests. "My father has given me a lot of advice throughout my business career- that's HRH Prince Alwaleed bin Talal in Paris not to say I always listened. When I was younger, I was naive and I learned the hard way the consequences of not always heeding my father's advice. Today I'd like to think I'm wiser; before I make an important business decision, 99% of the time I ask myself, 'What would my father do?' and it's usually the right decision. I'm proud to say that I follow his advice." Now that we've addressed all of that, for the rest of this article don't see him as a man born to extreme privilege and eye-popping wealth. Instead look at Abu Jenna as a self- induced workaholic, PETA-retweeter, Kurt Cobain style sneaker-wearer, tech-freak who quotes Apple CEO Tim Cook, and who spends his free time at home chilling with his family and playing PlayStation. Oh, and he likes to cook. "There is only one thing I don't want to talk about," says Abu Jenna, but I never find out what that one thing is since he answers every question candidly with no hesitation whatsoever (to the consternation of both Alkhoshaibi and Al Ansari). To sate the curiosity of those of you out there who want to know more about the fantastical Internet reports, here are some fast facts: Yes, he's met Michael Jackson, he is indeed a huge proponent of both the Kingdom and of Islam, and he doesn't eat meat as a remedy to a cholesterol issue (thereby eschewing taking prescription meds). Now that you've had your royal intrigue fix, please consider Abu Jenna as just Abu Jenna, and let's get down to business. KBW Investments, Abu Jenna's company, is an umbrella entity that acts as the epicenter of his corporate ecosystem. Part of this umbrella is Italian mainstay Raimondi Cranes SpA- the Prince gained control of the company in January of this year amidst heavy publicity. Raimondi, a century and a half old, now supplies cranes to Abu Jenna's other companies creating a circular chain of business, and he refers to Raimondi as the "jewel" of his portfolio. "The way that Ahmed [Alkhoshaibi] structured the company is very innovative- we can actually compete with the best crane companies in the world, and beat them about 30% price-wise. It's pretty much like the Apple model or the Tesla model; they opened their own stores so there's no middleman. The region is booming, and we can beat anyone's quote hands down." Shortly before this interview took place, KBW Investments acquired a 50% stake in Arcadia Engineering making him the Chairman, and that venture in turn will support Dorra Contracting out of Saudi and Qatar, and Next Generation Parking (NGP), yet another KBW endeavor. They're trying to create what Abu Jenna refers to as a "full-fledged bouquet of companies that work well together harmoniously." Basically, it's a synergistic-style conglomerate that makes cross-selling easy, and not just in the MENA region. A visit to kbw-investments.com can give you an idea of how many pies the Group now has their hands in. "So if there's a company that needs cranes, then maybe they need architecture, project management, and maybe construction." An article about KBW Investments in The Wall Street Journal says that they have interests in over 20 companies globally. One of these is KSA-based GT Tech, and Abu Jenna is the Chairman. GT Tech recently partnered with SME-centric Sage Middle East to act as the company's local partner in the Kingdom. At a press conference to announce the partnership during GITEX Tech Week in Dubai, GT Tech CEO Mohammed Al Mutabagani, who Abu Jenna calls "a dear friend", and Director and Head of Sage Middle East Keith Fenner both confirmed that they realize the challenges of gaining market share in KSA, and they've stressed that both sides were committed to being hands-on with Sage business solution software customers. "We see really expensive enterprise software that doesn't really add any value, as opposed to what Sage offers which is basically the same thing but at a much better price point. We rocked the boat with Oracle, they're on their feet in Saudi. We're getting good traction, and it's a new deal –only two months old- so we're just getting started," says Abu Jenna confidently. KSA is widely considered the hardest MENA market to master, and Abu Jenna admits that old habits die hard: "People get used to a certain product, and they hold on to that product with both hands. It's very hard to come into the market, but we see the value with the prices that we're offering- we're at least 65% to 75% cheaper than any other leading enterprise software company. Market penetration is going to be very slow, it's going to take a long time. I believe that Oracle is [in] the lead, you have SAP and HP, Microsoft in the third and fourth, and we're a distant fifth." At this juncture, I ask Abu Jenna if it's actually possible that Sage's 'Ajanib' will make on-the-ground progress in the Kingdom. He explains that before signing with Sage, it was stipulated that their people had to be on the ground along- side GT Tech's Saudi staff, and that having "the Saudi front, and the support from the 'Ajanib' so to speak is definitely as added-value- they know their products and they've all worked in the company for years." Abu Jenna asserts that dedication to the Kingdom across all levels is integral to gaining ground: "I hear about people who live in Dubai, but come to Saudi. That's a bunch of B.S.- if you work in Saudi, you live in Saudi, and you give me 100%. I don't deal very well with people like that honestly. There are a few people, full-time employees of Sage, who are in Saudi all of the time." Another tech venture of Abu Jenna's "started in 2004 when I invested in MISC, Mobile Innovative Solutions Company. Back before there were smartphones, people relied on SMS services, and we started a company around that. It's outdated now, but we were very successful. Now you have push notifications, you have Twitter, so it's outdated. We can see our financials tapering off slowly, but there are people who still use it -surprisingly and sadly- since I invested in this company, but I'd rather see more people deal with smarter phones and be more connected." Technology as a solution to societal ills is a topic that Abu Jenna warms to, and we touch on how it facilitates areas like citizen journalism, how social media rectifies what he calls the "distortion" between the mainstream media and reality, and even how tech and entrepreneurship could be a potential answer to conflict zones. "If you have more ways to infuse studied, positive risk for people, it will create more opportunities [in the Middle East]. It will reduce all the other garbage they're doing. Starting your own business is a positive trickle-down effect; you're feeding your family, you're contributing to the economy, and you're employing people. I call for their governments to give people opportunity to let their curative minds thrive, and focus a lot more on innovation- [startup accelerator] Gaza Sky Geeks is a fantastic chance for people to start something and do something from zero." Abu Jenna singles out Jordan's Oasis500 as a force of good, and he's toured ArabNet Riyadh for the past three years getting a glimpse of some of the participating startups. As far as money goes, he agrees with the somewhat unpopular industry-insider opinion that venture capital in MENA isn't real VC. "VCs act like banks here- they're not looking into investing in people and in the ideas. They're looking to protect their money and getting a high rate of return with as much collateral as possible. That's not VC." While he admits that the bulk of the region's business is in the Kingdom, he says UAE has undeniable commercial benefits like ease of starting up, a fact supported by the 2013 Doing Business report co-published annually by The World Bank and the International Finance Corporation (IFC). "One of the main reasons I chose Dubai is the simplicity of transacting business here, the simplicity of creating companies, and the legitimacy that Dubai, DIFC, and the government give to any business that's headquartered here. Honestly, with the vision of Sheikh Mohammed bin Rashid [Al Maktoum], and President Khalifa [bin Zayed Al Nahyan] and Sheikh Mohammed bin Zayed [Al Nahyan], it's one of the most active and attractive places to come into the region and do business in the region. We're not just focused on Dubai, we're doing a lot in Abu Dhabi that we'll be announcing in 2015. We've been very warmly welcomed in Dubai: Sheikh Mohammed bin Rashid who I've met a few times, and Sheikh Hamdan bin Mohammed bin Rashid [Al Maktoum], and Sheikh Tahnoon [bin Mohammed Al Nahyan], and Sheikh Hazza [bin Zayed bin Sultan Al Nahyan] of course who have all been very supportive." Abu Jenna doesn't expand upon their plans for work in Abu Dhabi going forward, but he does say that he's "interested" in hydroponics and sustainability, mentioning another KBW entity that trades in energy-saving LED lighting for their construction projects. Abu Jenna, in his capacity as Chairman of Levant Capital, was also a part of the deal that saw the private equity outfit and Citigroup's VC segment gain a $US100 million stake in Al-Raya For Foodstuff Co Ltd., operators of a popular KSA supermarket chain in February 2012. "That year, it was one of the largest acquisitions. It took about a year and a half to two years; it shouldn't have taken that long, but dealing with certain partners sometimes is very difficult. When you're nickel-and-diming, it's really tough when you're talking about big numbers." He seems to relish all types of quick progress, be it in a M&A deal or when talking about infrastructural improvements. Where does he see positive change happening? Abu Jenna has high praise for Saudi Arabian Minister of Ministry of Commerce and Industry, H.E. Dr. Tawfiq bin Fawzan Al Rabiah for his work: "He's doing an amazing job! One of the youngest appointed to the Ministry, and you see his blood, his mindset, his younger-generation style of thinking, so you're seeing a lot of transformation in the Ministry of Commerce. And that will translate into giving SMEs and startups and VCs a start in the region. However, you can't start in one ministerial sector, it actually has to be a fundamental change, and adopted by other ministries. So you have the Justice and Labor Ministries, these three main ministries, that need to work together to create an SME foundation and an entrepreneurial ecosystem." 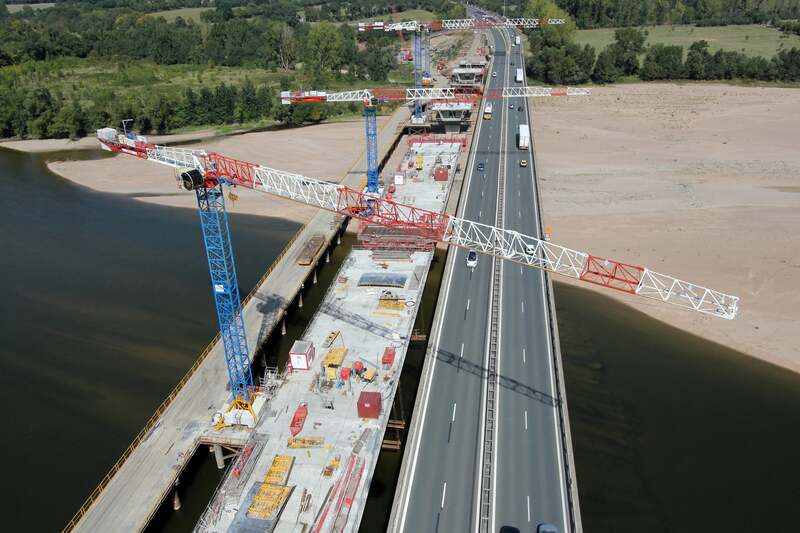 Raimondi Cranes at work building a bridge in Nantes, the south of France. The first of two 2014 European KBW Investments acquisitions, HRH Prince Khaled bin Alwaleed bin Talal became Chairman of the company in January of this year. From here we discuss the evolution of MENA's education approach, and also how the region is currently attempting to shift into staffing senior ranks with GCC Nationals, country by country. In terms of Saudization and Emiratization, he gives the example of Dubai. "Look at the heads of the largest institutions, you have very smart, shrewd businesspeople- foreigners with fine educations running the companies. But right under them, you have Emiratis. With all due respect, they [the foreigners] won't be there for very long- 10 years from now, I guarantee you that you won't see a lot of foreigners heading [UAE] companies. The vision of Sheikh Mohammed bin Rashid is definitely to have Emiratis running things." Abu Jenna doesn't think that Saudization should be enforced as a blanket policy per se, but rather adapted sector by sector, and he firmly believes in accountability structures put in place to ensure that if a Saudi isn't delivering then he or she can be pink-slipped just like everyone else. "I'm for Saudization, and I'm for seeing Saudis everywhere working, but I want fairness, so if someone isn't doing their job they should be able to get fired." He estimates that about 40% of his overall staff are Saudi Nationals, and he refuses to hire just to fill a quota- if they don't demonstrate the necessary skillset, they simply don't get a position at KBW. He's not a fan of "yes-men", and stresses that in the past those same yes-men have led to failure; his current team are encouraged to contradict him and to put the brakes on things when the necessary due diligence hasn't been done to their comfort. That said, some business mentions of Abu Jenna have become overly-personal, and because of that, "everything now goes through me" in addition to vetting by his team. I didn't ask Abu Jenna the businessman what it's like to be Prince Khaled bin Alwaleed bin Talal the royal because they'd become very separate people in my head, but I did ask him what it's like to have a great many people who assume he doesn't actually work at his namesake company. "I know that people think that, and I don't care what people think, honestly. About eight years ago, I stopped caring about what people said, and it's given me more time to focus on my family and my personal life, and my work." Abu Jenna's dual identities require very different strategies working in parallel, and to make business a priority that's the way he's going to keep it. "It is a high pressure position: the natural continuation of Alwaleed's legacy is a lot of responsibility, and I will never forget that it's a privilege. I'd like to think that my father has been preparing me since I was born to understand what that responsibility means and entails." Like father, like son.